Green Day frontman Billie Joe Armstrong performed the “Revolution Radio” track, “Ordinary World”, on NBC-TV’s The Tonight Show Starring Jimmy Fallon on September 22 and video from the program is streaming online. 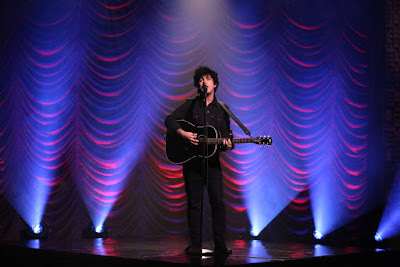 As Rolling Stone notes, "Ordinary World" was originally written for and appeared in the 2016 film of the same name, which starred Armstrong in the lead role of an aging musician; Green Day later repurposed the acoustic number as the closing track on the band's latest record. "After all of the chaos that's on the album – whether it's pop culture or whatever new apps we're using – everything gets so complicated,” the rocker told the magazine. “At some point you want something simple. That's sort of what 'Ordinary World' is about." Armstrong’s Tonight Show appearance came on the eve of Green Day’s performance at the 2017 Global Citizen Festival in New York’s Central Park on Saturday. The annual event to raise awareness and end extreme poverty also saw sets by Stevie Wonder, The Killers, The Lumineers and The Chainsmokers, among others. Currently on a break from a world tour, Green Day will return to live action with a series of dates in South America in November.